This pest can be distributed throughout the United States by transporting infested seedlings to new areas and by the exchange of infested scion wood used in grafting new trees. The insect lays its eggs in the buds of chestnut shoots then galls develop on the shoot tips, leaves and catkins. 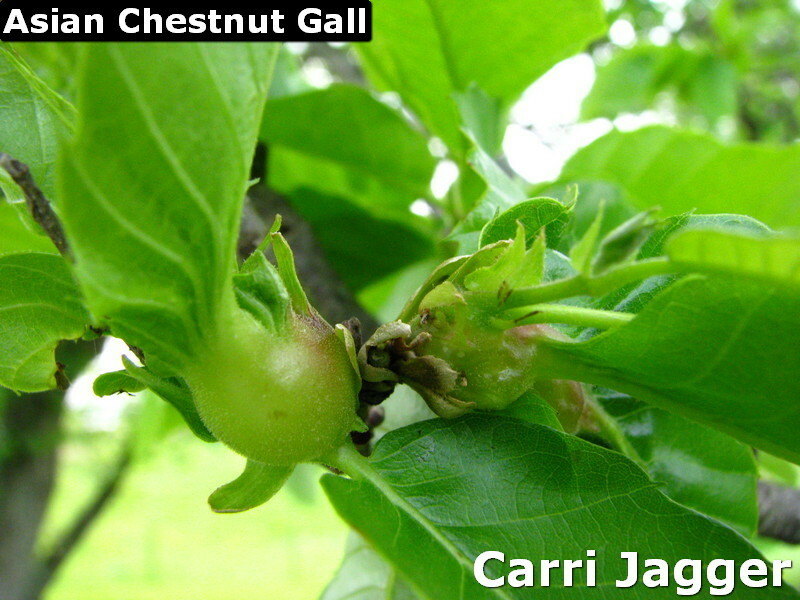 Nut production and shoot growth are greatly affected by the galls. Once the adult insect emerges from the gall the dried spent galls become woody and can remain on older limbs for several years. If the infestation is severe enough it can hurt the overall vigor of the tree and can even cause death. The adult female wasp is about an eighth of an inch long and they lay a cluster of three to five eggs in the chestnut buds during early summer. Several adults can oviposit in a bud which could add up to as many as 25 eggs per bud. Eggs hatch in 40 days with the larvae remaining dormant until the following spring. When the bud starts to grow the larvae induce gall formation on developing plant tissues. Before the larvae pupate they feed on the inner gall tissue for 20-30 days. The adult wasp emerges from the gall in late May to early June. Management of the pest is very difficult and insecticides are ineffective in suppressing the gall populations. There are natural enemies that attack and parasitize newly developing galls. If you have Asian Chestnut Gall you can prune and burn the infested plant material this may slow further movement of this pest.